TGIF! Thanks for stopping by today! Recently I told you about a great deal I got on a crystal chandelier at an estate sale. Well, while we were there we found a few other goodies. Mirrors! Come see! I am one of those people who LOVES to shop. Not for clothes, shoes or handbags, but antiques and home decor. It really is the thrill of the hunt. Antiques are very pricey in some areas of the country. Some more so than others. I still enjoy shopping in antique stores but lately I’ve had better luck with consignment stores and estate sales. I also have my own rule. If I know something is a good deal, I do not haggle about the price. I don’t want to insult the seller when they also know it’s a good deal. Plus, they need to make money too. Last week while my husband and I were out running errands we saw an Estate Sale sign. So, we swung by. We didn’t have anything in particular we were looking for, just curious. The house was about to go on the market and the owners had someone conducting the sale of almost everything in the entire house. There was even a golf cart for sale! We loaded them up in the truck and took them home. I googled “Howard Elliott Collection” and the item number from the box. They retail for up to $80 a piece! I can see why. 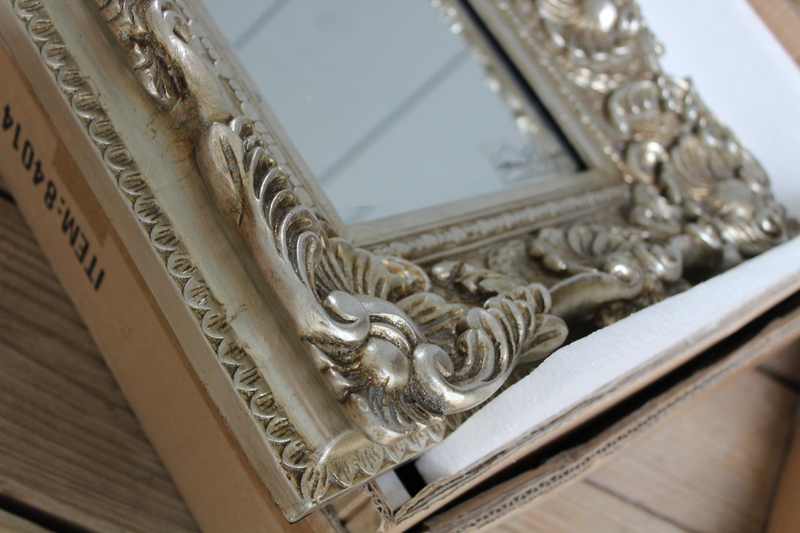 The frames are nice and heavy and have a great silver leaf finish. I wasn’t sure at first how I would use them. But after talking with my good friend, who happens to be a professional designer and home stager, she gave me a great idea! See the pretty detail? Her son recently got married and we were talking about my son’s upcoming nuptials. She suggested we use the mirrors on the tables and put the centerpieces on them. I LOVE that idea! I’ll run it by my son and his fiancé and her Mother of course. But, they are beautiful! So, regardless how I use them, they were a great buy. Like I’ve said before, any time I find a good deal on a great frame, I buy it.